Billy Porterfield, a longtime Texas journalist and author, died Sunday. He spent several years at KERA-TV. Billy Porterfield worked for KERA-TV's "Newsroom," a nightly news program, in the late '60s and '70s. Porterfield of Wimberley was 81. He had Alzheimer’s disease, according to a message on his website. In 1978, Porterfield joined the Dallas Times Herald as a columnist. In 1985, he worked for the Austin American-Statesman as a columnist. His worked appeared in The Saturday Evening Post and Texas Monthly, among other publications. He also taught at Southern Methodist University. His books included LBJ Country, A Loose Herd of Texans and The Greatest Honky-Tonks in Texas. In 2010, Porterfield donated his archives to the Southwestern Writers Collection, a part of the Wittliff Collections at Texas State University. The cataloged Porterfield archives comprise approximately 35 boxes and include clippings, correspondence, and manuscripts for all of his major books, numerous photographs, and other memorabilia. Porterfield described the decision to turn over his archives to the Wittliff Collections as a homecoming of sorts, noting that he and his brother Bobby went to San Marcos in 1952 to attend what was then Southwest Texas Teachers College (Texas State University). His first job in journalism was as a staff writer at the College Star. Porterfield loved the West and country living. He dressed in western clothes, often wore a hat and had an impressive horseshoe mustache. Cullum described Porterfield as a brilliant writer and something of a philosopher. 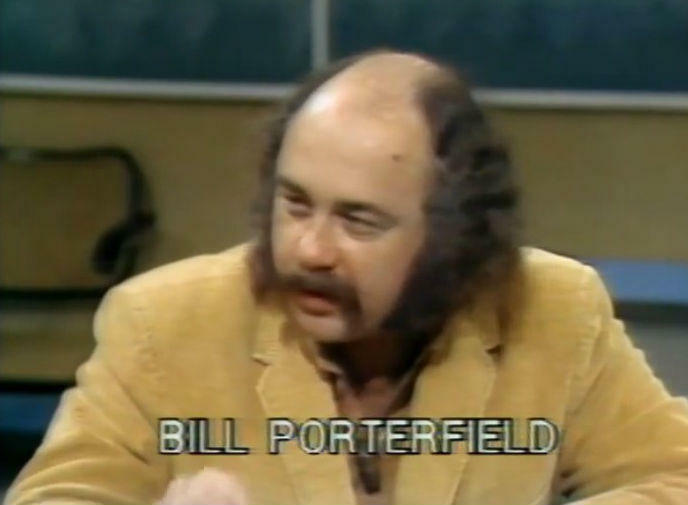 During one 1974 program, Porterfield responded to Cullum’s question about President Nixon’s decision to release controversial White House tapes. "He always hit home runs"
In August of that year, Nixon resigned. Porterfield was just getting started. He produced TV documentaries, became a newspaper columnist, taught at SMU and wrote several books. Whether he was producing TV documentaries, writing newspaper columns or books, or teaching, he was a character, Cullum said. “When Jim Lehrer was running the program, he would get impatient with Billy because he wanted more work out of him and Billy would say ‘I hit home runs’ and that’s the truth, he always hit home runs,” Cullum said. Survivors include his wife, Diane Barnard Porterfield; children Erin Porterfield of Tyler; Winton Porterfield of San Marcos; Oren Porterfield of Austin; Meredith Roach of Austin and Nashu Barnard of Haslet. A memorial service has been scheduled for July 27 from 2-6 p.m. at the Cheatham Street Warehouse in San Marcos. Explore Porterfield’s career and work at his website. Here's Porterfield's obituary on Legacy.com, via the Austin American-Statesman. Read Porterfield's obituary on his website. Read Porterfield's obituary in the Austin American-Statesman (registration required).